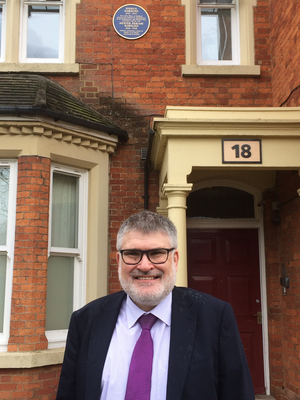 Mayor Dave Hodgson helped to conduct the recent unveiling of a Blue Plaque at the former home of Joshua and Hester Hawkins, two renowned figures in Bedford's history. The plaque is located on their former home at 18 Linden Road, which is now a YMCA property. "It was an honour to be involved in the unveiling of the new blue plaque at the former home of Joshua and Hester Hawkins, at the YMCA property at 18 Linden Road. Joshua Hawkins was a five-time Mayor of Bedford and was a driving force behind the development of both The Embankment and Bedford Park, two stunning features of the town that are enjoyed by thousands upon thousands of people to this day. What a legacy to leave! Hester Hawkins, meanwhile, was an author and Fellow of the Royal Astronomical Society. My thanks to all involved including the YMCA, local historian David Fowler and, in particular, members of the Hawkins family." An exhibition at Bedford Central Library curated by local historians Stuart Antrobus and Mary McKeown is running to coincide with the unveiling of the plaque, and can be found on the second floor until Monday 29 April.